Help us continue to make a difference in the lives of Canberrans by joining us for a fundraising breakfast on Wednesday 10 April at the Ainslie Football Club. 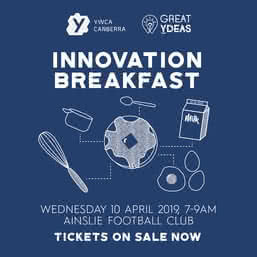 Our annual Great Ydeas Innovation Breakfast provides an opportunity for our members, supporters, partners and friends to come together to show their support for YWCA Canberra’s housing initiatives, showcase our 2019 Great Ydeas Small Grant recipients, and celebrate the YWCA movement. This year, all money raised will go towards supporting YWCA Canberra’s housing initiatives, which support women and families access affordable and safe housing options. Your ticket purchase will contribute to ensuring that all women, children and families in Canberra have the essential supports and resources that everyone needs to live. Why are housing initiatives important? Appropriate, affordable and stable housing is essential to the wellbeing of both individuals and communities and is a critical first step to building a life. The rising cost of renting in the private market and growing wait lists for public and community housing, however, are everyday realities for many Canberra families. YWCA Canberra provides housing support to Canberrans through several programs and has been providing community services and support for vulnerable families for 90 years, with a particular focus on women and their families, who are particularly at risk of homelessness and housing stress. The Great Ydeas Innovation Breakfast is a major fundraising event for these initiatives and an opportunity for the Canberra community to show its support for the important work we do. network with like-minded people from the corporate, government and community sectors. It is also an opportunity to celebrate the global World YWCA day, which is recognised across 120 countries. The event will also include a keynote address from Felicity Reynolds. Felicity was CEO of the Mercy Foundation from 2008 until 2019. She re-focused the Foundation on the issue of ending homelessness, through supporting structural change and encouraging the use of evidence-based approaches to link people experiencing homelessness with housing and housing support. Immediately prior to this, she was Manager of Community Support and Access at the City of Sydney. A department which included homelessness services, policy and research as well as aged, disability and community transport services. Felicity has Social Work qualifications from the University of New South Wales and is a former Churchill Fellow who used her fellowship to investigate effective responses to people who experience chronic homelessness. She is currently a Director on the board of the Australian Alliance to End Homelessness and continues to be a part-time member of the NSW Mental Health Review Tribunal. An appointment she has held since 2005. Felicity co-authored the chapter on homelessness services reform in the book Homelessness in Australia published by UNSW Press. So, gather your friends and colleagues, and purchase your ticket now! If you cannot make it to the event but still want to show your support for our work, you can donate to our housing fund via our website. RSVPs close Friday, 5 April 2019.